When I first saw this new Pokémon experience, I was hesitant at first. It looked nice overall, but as with many people, I was unsure just how the Go! mechanics would fit into the normal catch ‘em all style of the main games. As more footage released, I warmed to the new catching mechanics as the concept of the game seemed built around them and looked as though it worked well. Upon first starting this new adventure through familiar ground, there was plenty I enjoyed about it. The music brings to life the old tunes with orchestral flair, with the encounter and battle themes being a delight to hear. The visuals bring to life the world of Kanto in a bright colourful way, with characters human and ‘mon alike looking like they belong in the world, and each new location you visit looking stylistically different. 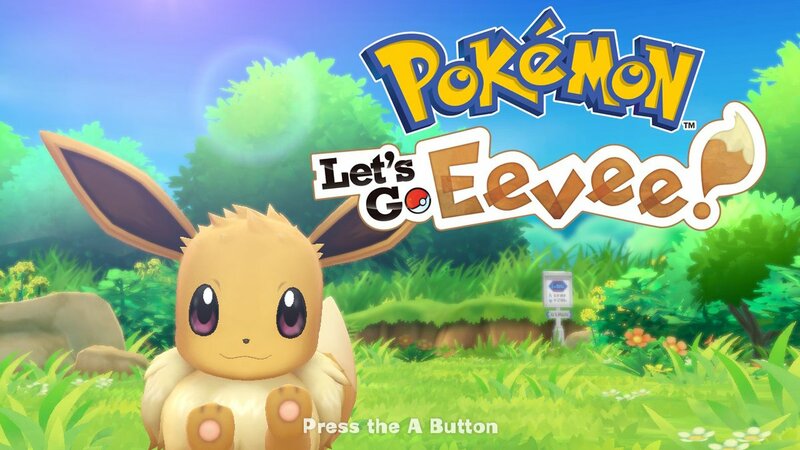 The challenge in the Let’s Go games isn’t a thing for the most part. Balls for catching the critters are everywhere, rare items to sell for money are also easier to obtain, and despite no experience share in sight all members of your party earn experience through catching new ‘mon and battling. If you catch the same critter over and over, you’ll also increase your combo chain to gain experience boosts the higher that chain is. It all depends on how seriously you take the training, but you can easily boost your team a couple of levels above what they need to be. I’ve been playing exclusively in handheld mode, and catching the critters is easy this way. Just aim with the gyroscope and press A to throw. The whole wild encounter has been streamlined down to catch or run, and it works. There’s little danger in such a system though. It almost makes one miss the cut and thrust of a real wild encounter, as there’s a whole lot more that can go wrong there. However, just because there’s no wild battling to be had doesn’t mean there’s no meaningful amount of actual battles. The proper battles are still the same as they’ve ever been. Stats, moves, natures – all the Pokémon basics are here that all the games have. And they work the same as all those other games too. 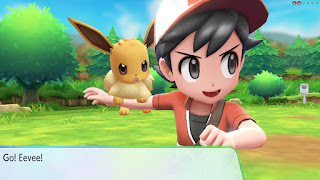 Yes, the starter Pikachu and Eevee are slightly overpowered – coming with a range of new moves they normally wouldn’t learn. But that doesn’t affect how you choose to go into the battles. Managing those stats is also easier thanks to the candies you can get, allowing you to increase a certain stat by one for each set of candies you give it [the amount increases the more you give to a ‘mon]. The idea of the main games has always been the journey you take with your team. That carries on here, but is now at the fore thanks to either Pikachu or Eevee being at your side at all times [unless you’re a heartless being who puts them in storage to forget about them]. Even if you do that, you can still have another ‘mon follow you, or even ride certain ones. 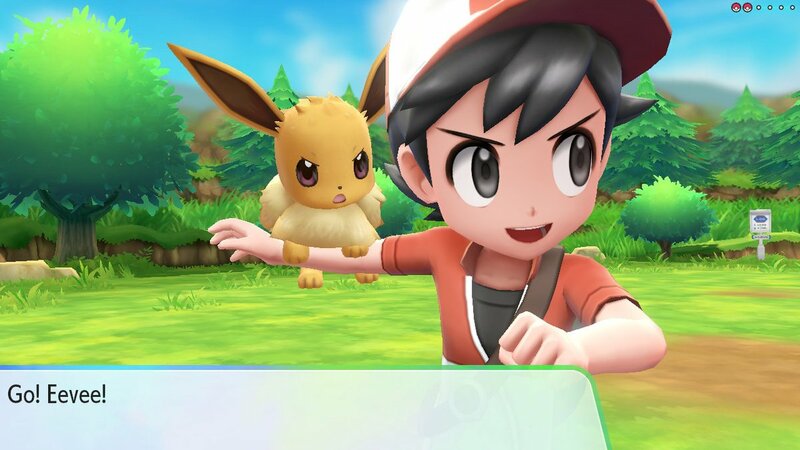 The connection you make to your team has never been stronger than in Let’s Go. And accessories give a little personal touch to you and your starter. The scaling of levels throughout the game is paced well from what I’ve seen, allowing you to easily manage everything that comes your way. The mechanics that the game has been built around work, and just because it seems a little cutesy, or foregoes the usual catching style, it shouldn’t be shunned. It feels every bit a main series title as Colosseum and Gale of Darkness do, and I would recommend the Let’s Go series to any fan of Pokémon.